Blockade and occupation of Taiwan's legislature enters day seven. Demotix/Craig Ferguson. All rights reserved.In the past two months, massive protests have gripped three far-removed states—Bosnia-Herzegovina (BiH), Ukraine and Taiwan. In every case, the foreign press has struggled to offer its readers more than banal geopolitical musings. While the positions of Washington, Moscow and Beijing are not irrelevant to these situations, neither are they particularly susceptible to the grievances and concerns of ordinary citizens. And yet it is precisely the efforts of ordinary citizens that have forced these countries to the global front pages. By treating the street mobilizations and occupations at the heart of these protests as tangential aspects of big power confrontations we obscure the experience of politics as a popular exercise—from Southeast Europe to East Asia—and lose sight of the essential and informative similarities between these events. All three countries fit into a sort of ‘third-generation’ of democratic awakenings. This is not the Arab Spring, where the concern was with entrenched autocrats, nor can the situation in BiH, Ukraine and Taiwan be likened to the anti-austerity revolts in established democracies like Spain and Greece—though these too have witnessed the appearance of ominously anti-democratic actors. Instead, these are ‘emerging democracies’, where nominally representative institutions are still dominated by static and corrupt oligarchies, assembled around a handful of political parties that maintain close linkages with criminal syndicates. Conveniently, a sheen of ‘ethno-territorial concerns’, ably manipulated by officials in all three countries, masks the tremendous citizen-led effort that has gone into creating genuinely popular movements, composed of all segments and communities in these societies. There is another, especially unfortunate, similarity to note, however. BiH, Ukraine and Taiwan have all, at one time or another, been labelled as fictitious or inherently reactionary polities by a curious alliance of local chauvinists and certain western “progressives.” In the case of the former, the rationale has simply been propagandist opportunism. The logic of the latter, however, has been considerably more muddled. Namely, that since individual regimes in Belgrade, Moscow and Beijing had and still do nominally oppose themselves to ‘western imperialism’, they were as a result standard-bearers of the global social justice movement and their opponents and/or victims tuto complete counter-revolutionary. This kind of logic is itself deeply reactionary, however, marginalizing not only the complicity of these so–called ‘progressive’ regimes in incredible campaigns of violence and extermination but, moreover, tarring entire ‘opposing’ populations with the taint of ‘fascism’. A thorough analysis, in contrast, requires that we take seriously the complexities of democratization and specificity of individual societies—rather than fitting all of human experience into bankrupt ideological dualities. To begin with, the attempt to place these countries exclusively into the arc of ‘anti-globalization protests’ glosses over crucial local dimensions. In both BiH and Ukraine, though post-socialist dispossession (‘privatization’) has engrained deep-seated resentment against local plutocrats, Euro-Atlantic integration remains an aspiration of large segments of the population. Not because the Bosnians and Ukrainians have any illusions about their peripheral status at the edges of the ‘known’ western world, but precisely because for many the alternative(s) appear still worse. Nor are the Taiwanese protesting against free-trade as such, rather they are steadfastly opposed to being economically, and eventually politically, swallowed up by Beijing. This does not make these movements backward, it makes them a product of local struggles. The terrifying spectre in these countries is not of ravenous foreign capital, though there is plenty of experience with this too, but of the persistent suffering of being an oft bloodied geopolitical borderland. And the tanks and gunships that have, are and are likely to come rumbling towards the plena, occupied squares and legislatures of Sarajevo, Kiev and Taipei are of the distinctly ‘near abroad’ variety. The second and, arguably, more important dimension of this conversation is about tactics—what Bosnians, Ukrainians and Taiwanese protesters can learn from one another. Democratization, if it is to be substantive, must ultimately be a bottom-up, grassroots process. Very generally, I think we can speak of three ‘phases’. The first involves a generally mass insurrectionary or, at least, oppositional character, usually marked by spontaneous mobilization, energy and anger. The sudden ferocity of the Bosnian protests was exemplary of this first overture. 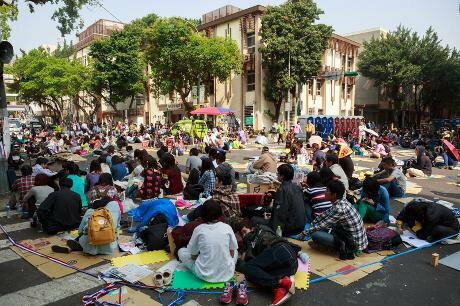 Once the initial episode of militancy subsides, the second phase consists of permanent occupations and blockades of practical and symbolic centres of power—public squares like the Maidan or, in the case of Taiwan, the legislature itself. In an ideal world, the final step will include both the creation of new establishment actors (e.g. progressive-democratic political parties) and extra-parliamentary forces (e.g. autonomous and organized social movements). This, however, is a lengthy process with the likelihood of setbacks at every juncture, especially in the form of overt foreign-backed ‘counter-revolution’, as in the case of Ukraine. None of these countries fits perfectly into this timeline and aspects of each episode have a habit of appearing half-formed in earlier moments. Moreover, it is still far too early to offer definitive analyses in any of these cases. Nevertheless, we can so far observe the following: in BiH, we had instances of brief militancy, coupled with spontaneous citizen plena but no lasting occupations, sustained street protests or new political parties. Nor have clearly democratically-inclined establishment actors emerged in Ukraine out of the sustained street violence and occupations. Moreover, the possibility of war has sharply narrowed the ability of genuinely progressive forces to organize against reactionary nationalists. Meanwhile, the massive crowds assembled by the Taiwanese students have engaged only in peaceful civil disobedience as they have successfully occupied their country’s halls of power. Nevertheless, the intransigence of the ruling Chinese Nationalist Party (KMT), and the ‘spent’ character of the opposition Democratic Progressive Party (DPP) suggests this confrontation is still in only its early days. We can also begin to draw certain organizational conclusions, however. No democracy can exist where elites do not fear being toppled by the citizens—at the polls or in the streets. Moreover, claiming that democracy means only elections empties the term of its substance and promotes unaccountability and corruption in emerging democratic regimes. Secondly, the promotion of democratic practices within protest movements is integral to preserving them as genuinely transformative initiatives. Rather than wide-eyed utopianism, the participatory and directly democratic aspects of the plena in BiH and the occupations in Taiwan signal sober political acumen—they are the change they want to see. Finally, the relationship between numbers and tactics is important. Bodies in the streets are essential as is confrontation with the authorities. But the more violent a movement is, the more polarizing and less democratic it tends to become. As such, street warfare in Kiev promoted the emergence of hierarchic, nationalist militias while non-violent resistance in Taipei has produced and been produced by a network of horizontal working groups. Democracy has opponents, though, as all three of these movements are discovering. In the coming months, the need for meaningful solidarity campaigns will only grow. Diaspora mobilization while important is not sufficient. Activists in emerging democracies must exchange experiences and support each other across cultural and geographic barriers. Widely accessible digital platforms already provide these connections locally, now they must do so globally. We must help each other as it appears no one else will. Additional insights into Taiwanese politics and media were provided by Elise Wang of Princeton University.